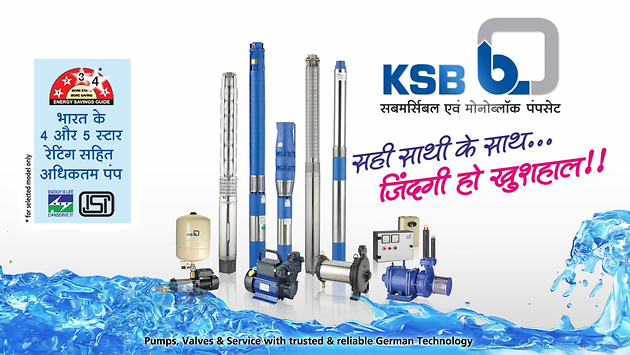 KSB in India committed to deliver a comprehensive range of pumps for residential or domestic use. KSB expanded its product range for water pumps by commencing manufacturing its own range of mini-monobloc and monobloc pumps in the year 2001. With the robust German technology and an experience of more than 60 years in submersible pumps, today KSB is delivering a large variety monobloc pumps, both in horizontal as well as vertical executions. In addition, control panels - GARDO, GARDO Plus, DStart and “Conti”- flat PVC cables for pumps are added to the product range. These products are available through our dealer network of over 800 authorised dealers spread across India and served round the clock by our well trained over 200 authorized service centres.